Facebook is not a platform that's synonymous with privacy -- far from it. In addition to the things users purposefully share with the social network and the people they are connected to on it, there have been a seemingly endless string of scandals about unauthorized third parties being granted access to private data, data being shared between apps, and so on ad nauseum. With today being Data Privacy Day, Facebook is trying -- apparently without a faintest hint of irony -- to jump on the bandwagon. Starting today, the company is launching a new Privacy and Data Use Business Hub, as well as inviting users to take a Privacy Checkup. Advance warning: Facebook is closing down photo-sharing app Moments in a month -- time to save your pictures! 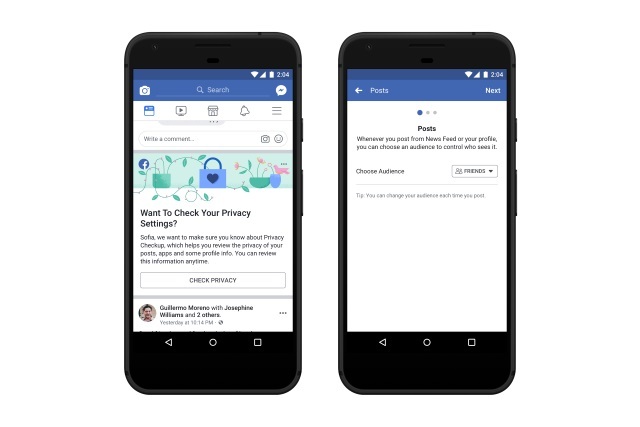 Facebook is looking to encourage people to check who can see their posts, and which apps and websites make use of login data. The company says that prompts will be shown to users over the next two weeks, starting today, but stresses that it is possible to take a Privacy Checkup at any time. This new hub contains information on topics like our Ads and Privacy Principles, how data is used in our ad products, and guidance to help companies understand rules like GDPR. You can access the Privacy and Data Use Business Hub here. While Data Privacy Day is a good time to think about protecting your information, we're continuing to work throughout the year to improve the privacy controls we offer on Facebook and better communicate about how we protect people's information. Last year we made our privacy settings easier to find, improved our tools for accessing and deleting your information, and published our Privacy Principles. This year we'll do more to explain how Facebook uses people's data and provide people with more transparency and control. For example, in the coming months we will launch Clear History, a new control to let you see the information we get about your activity on other apps and websites, and disconnect that information from your account. Given the criticism the social network continues to face about data usage and privacy, the measures announced today are unlikely to do much to win over the naysayers, but Facebook is not a company to miss a PR opportunity -- however ironic it may seem.